I wish I had a way to check out some of the action. Is it not shown on cable at all in the US? You guys have a million channels, I thought it might be on there somewhere. Not on any channel that I get. I don't have a satelite or anything like that however. So maybe you can get it on some of those services. I'll doubtless start a Test thread come November, so that will help keep you informed, ha. I wish I could, I think I may go post the England team in the bad joke thread. :lol See how nice I've been not mentioning the Champions Trophy? Such restraint. Eugh...that was such a dismal performance. Six wickets...it was a bit of a hammering. Still, Test matches are a whole different scenario, anything can happen. You can watch it via those services, yes. It airs via the Dish network. Australia has advanced to Sunday's Champions Trophy final with a hard-fought 34-run win over arch-rivals New Zealand in Mohali. Half-centuries from Ricky Ponting and Andrew Symonds had earlier guided the Australians to 9-240 after Kiwi captain Stephen Fleming elected to bowl first. But with Glenn McGrath leading from the front, New Zealand capitulated to a woeful 6-35 before being eventually bowled out for 206 after a remarkable seventh-wicket rally from Jacob Oram and Daniel Vettori. Following an early let-off when Vettori was dropped by Mike Hussey at first slip on five, the pair added 103 runs in 125 balls until Symonds' off-spin caught out Oram (43) with Adam Gilchrist completing the stumping. Vettori ploughed on, however, but unluckily fell in Mitchell Johnson's first over back into the attack when he played on for a superb 79 in 103 balls. McGrath had started the bloodbath when opener Lou Vincent fended to Ponting at second slip for one before quickly following up with the scalps of Hamish Marshall (five) and Peter Fulton (two). The veteran paceman ended up bowling his 10 overs straight, finishing with the figures of 3-22. In between, Brett Lee (2-31) had crashed a huge seamer into Nathan Astle's middle stump for no score before Lee's replacement Nathan Bracken (2-36) took just four deliveries to tempt familiar foe Fleming (15) into swiping at a wide outswinger. With wicketkeeper Brendon McCullum also gone, Vetorri and Oram set about an unlikely comeback although despite their heroics, the required run rate continued to rise well above six an over. And when Vettori was bowled via his pads in the 43rd over, even Kyle Mills' last-gasp 21 from 17 deliveries couldn't save his side. Ponting (58) had earlier shared half-century stands with both Damien Martyn (26) and Hussey (35) before getting himself out in Mills' second spell. But it was Symonds who showed all the tricks of an elite one-day middle order batsman with a series of nudged twos and threes in an intelligent knock. His run-a-ball 58 included just four boundaries although he did despatch Vettori back over the bowler's head for a massive six early in his innings. Ponting and Martyn led the score from 2-4 to 2-70 with the on-song Martyn, who had scored 78 and 73 not out in his past two Champions Trophy outings, racing to 22 from 29 balls after a sluggish start. The timely introduction of Vettori's left-arm spin halted Australia's progress, though, with a frustrated Martyn out attempting to sweep for 26. And Vettori was involved in Ponting's wicket when, like Shane Watson, the skipper was tempted into a false stroke in Mills' comeback over after having just bought up the 50-stand with Hussey with another beautiful straight drive down the ground. The West Australian eventually fell to the expensive James Franklin (1-48 off eight overs), caught at backward point, before Symonds was bowled around his legs by a Shane Bond full toss after having been dropped moments before by Vincent. As well as Ponting, Mills also dismissed both Australian openers and Michael Clarke in his penultimate over to finish with an impressive 4-38 while speedster Bond returned 2-55.
:banana Andrew Symonds is currently the best one day player in the world. Don't let anyone tell you any different. So cricket, eh? Wow what a sport! has his bowling improved at all since last summer? because he was getting knocked up for quite a few runs. 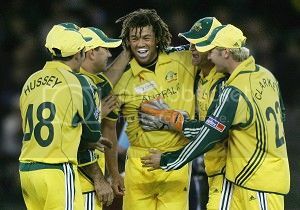 as a batter and feilder he is awesome. I think so yes. He's not technically a great bowler by any means, but he seems to have the knack of getting wickets when they are most needed. He's a guy who seems to play at this best under pressure. 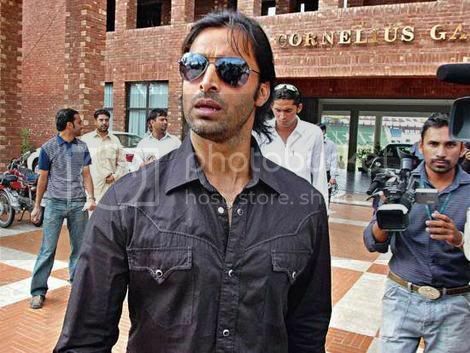 Pakistan's top bowler Shoaib Akhtar was banned for two years and teammate Mohammad Asif for one year after they tested positive for a banned steroid, an official said. A three-member doping tribunal appointed by the Pakistan Cricket Board ruled the pace pair out of all international and domestic cricket, meaning they will now miss next year's World Cup. Akhtar, 31, and Asif, 23, were sent home in disgrace from the Champions Trophy in India on October 16 after the board said the performance-enhancing drug nandrolone had appeared in their samples. The pair now have the right to appeal, officials said. Both insisted they did not take any banned substances knowingly, but they waived their rights to have their "B samples" tested. The scandal is international cricket's first involving performance-enhancing drugs and Akhtar's ban is the sport's heaviest ever for doping. The pair can appeal the decision either with the same tribunal within seven days; with a different committee appointed by the board within 30 days; or with the sports court of arbitration in Lausanne, Switzerland, officials said. "Akhtar contested the case saying that he has been on a high-protein diet which contained beef, chicken meat and other dietary supplements and he also said he took some herbal medicines from a Hakim [herbal expert] but he couldn't prove them," Hamid added. "Asif's case was different... Pakistan physician Darryn Lifson confirmed he stopped him from taking a banned substance a few months back," said Hamid. The ban may effectively end Akhtar's mercurial career, which has been marked by controversy over his bowling action, indiscipline, injuries and ball tampering. It is cricket's highest profile doping case since Australia's legendary leg-spinner Shane Warne was banned for a year in 2003 after testing positive for a diuretic. Akhtar, who has taken 165 wickets in 42 Tests and 133 in 208 one-day internationals, is famously known as the "Rawalpindi Express" for his pace and for his home town. He launched the fastest electronically measured ball ever bowled - at a speed of 161.3kmh - against England in February 2003 at the World Cup in South Africa. This is big news - Darrell Hair has been sacked from the ICC panel according to early reports. Only England, the Kiwis and the Aussies voted to retain him. Watson and Martyn had standout games.